For those of you who haven't been subjected to my barrage of tweets concerning the stress of moving house, that's what I've been doing... Normal service shall commence now. When it comes to books, I am voracious. My partner has mentioned being somewhat reluctant to introduce me to his favourite authors as I tend to just go away and read all of their work. Whereas in real life I like to save things, to draw out the anticipation, with books I am quite simply, hopeless. But what happens when you finish reading a body of work by an author you love? I've touched upon this before with my piece on the Harry Potter series, but as an adult, there are authors that are even more difficult to part with. I recently finished Factotum by Charles Bukowski and it was a wrench. I had a huge Bukowski binge back in my second year of University. At my partner's suggestion I began with Post Office. Once I'd started, I just couldn't stop. To me, it seemed I'd found an author who managed to combine grounded realism, with this enduring belief in the beauty of existence, leading to stories with unexpectedly profound moments. This is equally the case for his poetry, which I have also read ad nauseum. I went out and bought the novels my partner didn't own, though could not get my hands on Factotum in the local book shop. After I while, I suppose I moved onto another author (probably Milan Kundera). I sort of liked the idea that there was a Bukowski book that I hadn't read. It was comforting to know that I had that to turn to in a time of need. And it's not like I've been without Bukowski... I have picked up a couple of collections of his short stories in second hand book shops. And then there is the poetry, which I have continued to read, as well as that wonderful documentary Bukowski: Born Into This, and Barfly, the making of which is recounted in Hollywood. I've also read an excellent biography of old Buk by Howard Sounes. During the past couple of months, I've been extremely stressed. There have been a lot of pressures associated with moving to a new city, and I'm never one to cope well with stress... Having been gifted Factotum by Adam this past Christmas, I reached a point in January, where I knew I had to read it. 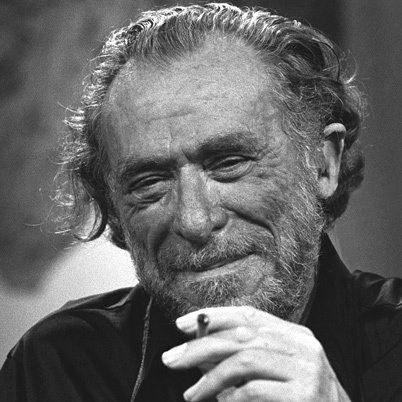 I was anxious and the familiarly comforting voice of Bukowski was calling me... The book was predictably enjoyable, packed with anecdotal tales of Henry Chinaski's job hopping, gambling, and writing. I didn't want it to end. But of course it did end (it's actually a comparatively thin volume), and I have no more Bukowski to discover. I felt rather sad for a time, but eventually came to the conclusion that as long as those writers exist, I'll be ok. At my most despairing moments, I can reread something by Bukowski, or Kundera, or Woolf, and feel less alone. For me, that's what great literature is all about.